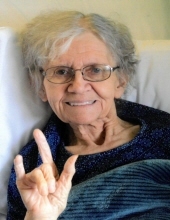 Mary C. Vogel Swihart, 85, of Mansfield passed away April 12, 2019 at Ohio Eastern Star Home in Mt. Vernon. Mary was born January 10, 1934 in Galion to John W. and Eva Zeller Vogel. She was a beautician in Mansfield at Marian's Beauty Shop after graduating from Mansfield Beauty School and later retired from banking. Mary was a member of the Eagles #336, Mansfield Deaf Club, St. Peter's Catholic Church, and currently a member of the New Life Church of Christ in Bellville. She married Thomas Swihart on September 7, 1974 and enjoyed sewing and working in her flower garden. Survivors include her sister Grace Rogers of Fredericktown; nieces and nephews John & Patricia Rogers, Don & Laura Rogers, Deb & Jeff Bowman, Scott & Gina Rogers, Betty & Doug Severns; eight great nieces and nephews. In addition to her parents, she was preceded in death by her husband Thomas; a brother Joseph Vogel; and nephew Ron Rogers. Friends may call at Herlihy-Chambers Funeral Home, 173 Park Avenue West on Sunday from 3 - 6pm. A funeral service will be held Monday at 11:00am at the funeral home with Dave Jones, Kyle Thompson and Steve Kessler officiating. Burial will follow in Mansfield Cemetery. The family would like to thank the wonderful staff at Ohio Eastern Star Nursing Home along with the ladies from New Life Church of Christ for their love and support. To send flowers or a remembrance gift to the family of Mary C. Swihart, please visit our Tribute Store. "Email Address" would like to share the life celebration of Mary C. Swihart. Click on the "link" to go to share a favorite memory or leave a condolence message for the family.